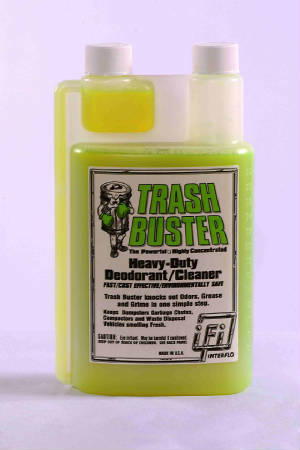 TRASH BUSTER Puts a lid on odors! This powerful, highly concentrated, heavy-duty, deodorant cleaner is fast, cost effective and environmentally safe. Eliminates odors on contact, emulsifies grease, grime and dirt allowing you to just wash it away. v Works wonders on trash shoots, trash compactor and garbage collection sites. The perfect solution for outdoor kitchens, areas with high temperatures and excessive humidity. Great for public restrooms and non-ventilated locations. Our patented odor counteractant eliminates ALL odors. No need to mask odors when you can eliminate them. Eradicates and prevents odors growth caused by humidity, moister and floods. Removes odors and cleans in one simple step.